Leftover Biscuit Dough? 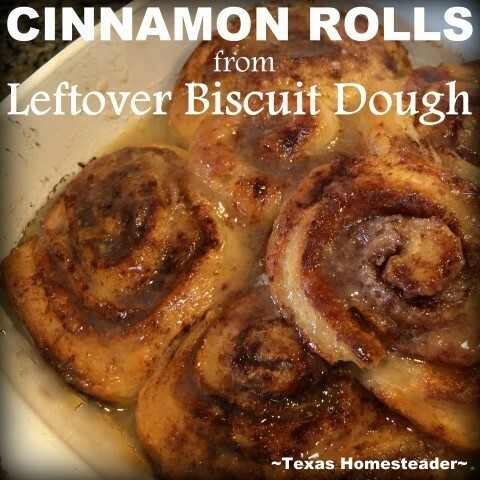 Make Homemade Cinnamon Rolls! I tried unsuccessfully for years to make delicious homemade biscuits for RancherMan. When I say unsuccessfully, I mean they always turned out too dry & crumbly. Or with not enough flavor. Or just plain blahhhhh…. But I’ve finally stumbled upon the secret of delicious, moist, flavorful homemade biscuits! I make them often for RancherMan and sometimes I put jalapenos & cheese in them too! So after I’d patted the dough out and cut them into biscuits I gathered all the trimmings and rolled them together. I added about 1/2 cup sugar & kneaded it all together. This will lightly sweeten the dough. Don’t worry – more sweet is coming along! Then I rolled out the dough again, this time rolling it as flat as I could comfortably get it. I used a repurposed bred bag between the dough & my rolling pin to make this task easier. Finally I got it down to about 3/4″ thick. Since this is just biscuit dough, I sprinkle the flattened dough liberally with cinnamon & sugar to sweeten it more. Then I dot the surface with butter. I’m pretty liberal with this as well since my cinnamon rolls won’t be a light fluffy yeasty bread, but heavier biscuit bread. I want the butter to melt & soften my cinnamon rolls. Now I roll the dough into a long log. I cut the log into about 1″ to 1.5″ rounds and place them in one of my grandmother’s Corning Ware dishes. Then right before placing them in the oven alongside my homemade biscuits, I sprinkle the exposed surface with more cinnamon & sugar and dot each one with a small amount of butter. The butter will melt through the middles adding a little extra mmmmmmmm! That leftover dough makes a small pan of about 4-6 cinnamon rolls – perfect for us! Now I simply place them into my oven at the same time I place my skillet of biscuits and they both cook at the same time. When they come out of the oven I want a little drizzly icing for the tops. So I stir up about a cup of powdered sugar, a few drops of vanilla extract and a couple of drops of milk – just enough to make the icing thick enough to stay on top of the cinnamon rolls but thin enough to drizzle. Per-FECTION! When I serve my handsome man his special breakfast there will be biscuits & gravy, eggs and bacon. And then I have a little sumpin-sumpin extra – decadent homemade cinnamon rolls. He LOVES those! I’m thinking next time I might roll in some of my homemade apple pie filling to make an apple frittery kind of delight, whaddya think? The apples could add some of the moisture that the excess butter was doing in this version. I think it might be delicious, so I’ll try that next time. In the meantime I love that I’ve figured out something very fun, delicious and quick to make good use from that leftover biscuit dough. He requests cinnamon rolls every time now! So if you are making homemade biscuits and wondering what to do with that extra dough, give it a try! Since there are so many variables (How much dough you have leftover, how sweet you like your cinnamon rolls, etc) there’s really not a recipe, per se. But here’s the quick instructions as I made ’em. Roll leftover biscuit dough approximately 3/4″ thick. Dot with butter. Sprinkle liberally with cinnamon & sugar. Top with frosting made of powdered sugar, a few drops of milk and a few drops of vanilla extract if desired. This entry was posted in Blog Posts and tagged Cooking, Frugality, Make-It-Yourself, Recipes on March 26, 2017 by Texas Homesteader. I just made these, and they LOOK and SMELL amazing! I’m hoping they will keep in the fridge overnight until so we can have them in the morning. I didn’t put the icing on them; will wait til morning for that step. Oh my goodness, but those look wonderful. 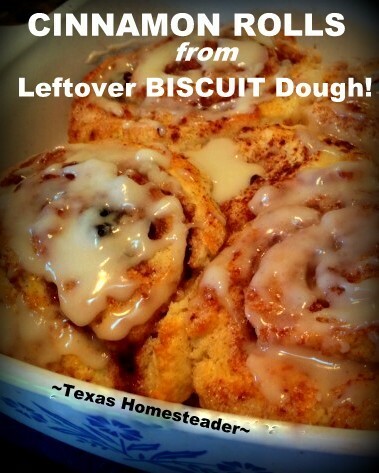 I can’t imagine having leftover biscuit dough. The most I end up with is a tiny 1-inch puck, which I just bake alongside the biscuits. It gets extra crispy, of course. But I think I will try turning my biscuit dough into cinnamon rolls using your recipe and method one of these days. What a special treat that would be!